The finding could indicate a biological subtype of PTSD whose clinical relevance only becomes obvious when patients undergo treatment, the researchers said. 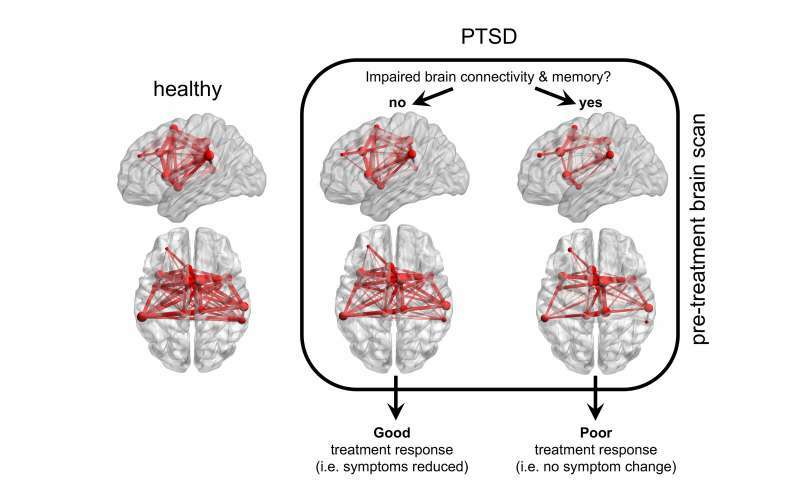 Furthermore, by replicating their results across a diverse range of patients, the researchers were able to clearly and objectively characterize a biological signature in PTSD patients who differ in their response to behavioral therapy. The gold standard of behavioral therapy for PTSD is called prolonged exposure therapy. This treatment involves gradually exposing patients to trauma-related fears, such as loud noises or crowds. Through repeated exposures, patients become accustomed to these triggers and suffer less distress from them. "However, exposure therapy does not work for everyone with PTSD. By better understanding the biological components of the disease, we hope to be able to develop more personalized treatments for patients who are struggling to recover," said Amit Etkin, MD, Ph.D., professor of psychiatry and behavioral sciences and lead author of the study. For the study, the researchers turned their attention to a brain network called the ventral attention network. The VAN is critical in cognition and memory. Abnormalities in this network have been linked to a range of psychiatric conditions, including schizophrenia, depression and anxiety. The scientists found that some individuals with PTSD have both reduced VAN function and diminished ability to recall lists of words during a during a memory test. Those with both traits were not responsive to exposure therapy. This was the first study to use biology to identify two types of people with PTSD, thereby transcending diagnosis based on clinical grounds alone, Etkin said. The researchers identified a clear brain-function marker that could be pinpointed regardless of whether the study participants were civilians or veterans, or how their clinical diagnosis was made. "We really have to start utilizing these kinds of biological markers in order to get at a more fundamental understanding of the disorder and a far greater prediction of treatment response," said Ruth O'Hara, Ph.D., the study's senior author and a professor of psychiatry and behavioral sciences. The study will be published April 3 in Science Translational Medicine. Among people who experience or witness a traumatic event, most will be faced with temporary difficulties in the short term but will recover over time. Others may develop PTSD. Symptoms, such as nightmares, heightened anxiety and intrusive memories, can persist for months or even years. Such individuals typically go on to receive exposure therapy. Yet some patients do not benefit from it, and about a third drop out of treatment, according to O'Hara. "There is a critical problem in the treatment of psychiatric disorders," she said. "Diagnoses are all based on psychiatric symptoms, which for the most part are self-reported. And there is a huge amount of heterogeneity in how people self-report." To develop more personalized treatments, the researchers examined PTSD patients' behavior and brains to understand why some patients don't respond to exposure therapy. They conducted two studies with demographically and clinically distinct patient populations. 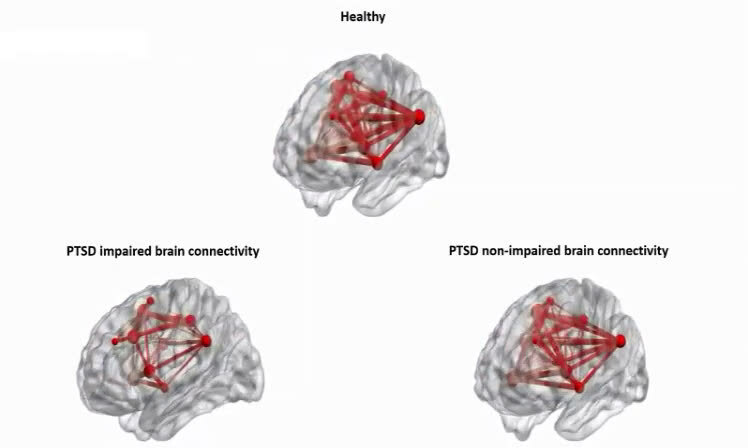 In the first study, 112 participants, 76 of whom had been diagnosed with PTSD, underwent behavioral and clinical assessments, as well as functional magnetic resonance imaging to measure brain activity. They also completed a test of their ability to recall words. In the test, they were asked to memorize blocks of 20 words and then recall them immediately and again 15 minutes later. Sixty-six of the participants with PTSD continued on to a second part of the trial, in which they received either prolonged exposure therapy or no treatment. The majority of those participants then completed a clinical assessment of their PTSD symptoms. In a second study, the researchers considered 245 combat veterans, 117 of whom were trauma-exposed but healthy and 128 of whom had been diagnosed with PTSD. They underwent behavioral and clinical assessments, including the verbal memory test and an fMRI scan. In both studies, the findings revealed that a subgroup of participants with PTSD had both reduced verbal memory and VAN functioning compared with the rest of the PTSD participants and healthy control subjects. The researchers observed that participants with PTSD who had reduced verbal memory and VAN functioning did not respond to therapy, whereas the other participants with PTSD did respond. The finding emphasizes the importance of considering a patient's biology in developing a treatment for their PTSD, O'Hara said. "Our study shows that this specific combination of a deficit in VAN communication and poor memory leads to a failure to respond to exposure therapy, above and beyond their specific symptoms," she said. In another study reported in the same paper, the veterans also underwent a direct brain activity test that used simultaneous transcranial magnetic stimulation and electroencephalography, a test that measures brain waves. 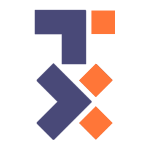 TMS is used to noninvasively manipulate activity in a targeted brain region and the networks to which it's connected. Unlike fMRI, which shows a correlation between a certain behavior and brain activity, TMS allows scientists to temporarily disrupt information processing in a particular brain region through magnetic pulses and see exactly which behavior or brain function is affected. To detect these effects, participants were also hooked up to an EEG machine, which picks up the communication between neurons using sensors that are placed on a patient's scalp. The TMS and EEG tests revealed that the brains of veterans with poor connectivity in their ventral attention network took twice as long to recover from the TMS magnetic pulse than the brains of patients with good communication in their VAN, indicating a deficiency in information flow within this brain network. Etkin hopes to use this information as a means to develop more specialized mental health care. Down the road, clinicians could potentially perform repetitive TMS—a therapeutic tool that is currently used to help treat depression—to stimulate the VAN and ease PTSD symptoms. A consistent challenge in creating personalized treatments for psychiatric conditions is that the Diagnostic and Statistical Manual of Mental Disorders, which classifies all mental disorders, is constantly evolving. But if clinicians can one day use biological measures instead, they will no longer have to deal with these varying definitions of disease, Etkin said. Etkin and his team aim to translate their findings into treatments for PTSD. Brain-imaging studies of psychiatric disorders often stop short of that translation, he said. "To me, that's not satisfying," he said. "If you were to take these findings, how would you set up a study that would allow you to get to an FDA-approved biomarker quickly—not in 20 years, but in five years? That's what we are now focused on."